Parking is never easy in the Big Easy but during the Mardi Gras season it becomes nearly impossible and this years Mardi Gras was, perhaps, the worst in New Orleans history of Mardi Gras celebrations. Due to the rain on Lundi Gras, March 4, 2014, it wasn’t as difficult to park but March 3rd, Lundi Gras, saw the city packed. Along with the huge surge in the parking requirements due to the tourists coming for the parades there is a corresponding surge in the price. Event parking a few blocks away from the parades jumped to $50 for your stay and they were parking them anywhere they could pile them in. Some celebrants chose to get around the high prices by parking illegally. Unfortunately for them, New Orleans has an amazing fleet of cutting edge tow trucks. They can swoop in, back up to a vehicle, latch onto it, and have it out and on its way to the impound lot in less than 60 seconds. One celebrant was heard to say, “I know I was parked illegally but I was in so tight between the cars in front and back of me there was no way they could tow it.” What left the pernicious parallel parker perplexed is that New Orleans has high tech tow trucks that can slide under a vehicle from the side, lift it out of the tight spot, and speed off to the impound. How do they handle such an influx of impounded vehicles? They store them under the interstate highway that rides overhead through New Orleans. 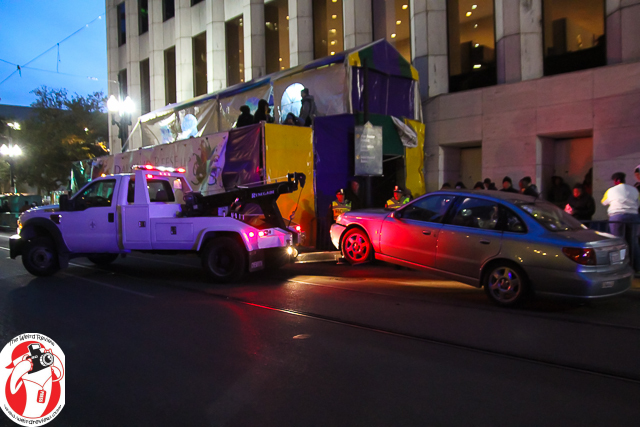 Normally the impound takes up the length of two city blocks but on Lundi Gras they used eight city block lengths of the underpass. What can you do to park cheaper during Mardi Gras in New Orleans? 1) Go early by two or three hours and park in a location that will give you ten hours for a flat rate. If you park in a location that is going to be less than your stay, don’t expect the parking authorities to be nice. You can expect it to be towed or booted. 2) Take cash. Even on the evening of Lundi Gras there were a few places that still had spots at $20 for the evening but they were not the regular parking areas and only took cash. 3) There is free parking under the Interstate but don’t park where they are impounding vehicles. It is a bit of a walk to the parade route and it is a bit spooky so better to travel in a group or pay for your parking. On the other hand, if you park illegally you will find your car under the interstate anyhow, and it won’t be free parking. Check out the Mardi Gras Memories photo albums for more Mardi Gras photos! Are you going to post Orpheus and Proteus on Monday, March 3, 2014? I was there! Did we meet?